The Department of Recreational Sports is diligent in its efforts to make every part of a facility available to the community, including people with disabilities. If you have specific questions or may require additional accommodations, please contact Member Services at 979-845-7826 to discuss your potential needs. The entire Climbing Wall area is wheelchair accessible. The Climbing Wall is equipped with protective equipment and a special haul apparatus that assists in ascent and descent for people with mobility limitations. For more information and to discuss potential needs for using the Climbing Wall, please contact 979-845-4511. Click here for more information about Outdoor Adventures. Several pieces of FreeMotion equipment, along with two Life Fitness dual adjustment pulley systems, allow an individual using a wheelchair or in a seated position to perform a wide variety of resistance training exercises. The SciFit upper body ergometer is an upper body hand cycle with multiple programs and heart rate monitoring. While dumbbells are not considered an ADA compliant exercise device, it is well documented that experienced strength trainers with disabilities can perform a multitude of strength training exercises with this equipment. Please remember that the Strength & Conditioning Area staff are there to assist all patrons. Just ask any staff member for assistance, or if you are interested in the services of a personal trainer, please visit the Member Services desk in the lobby of the Rec Center. Rec Sports has a variety of indoor and outdoor sports equipment available for groups and individuals to use. Most equipment is available free of charge, while other items do have a rental charge. Patrons will be responsible for damages to items that are rented or checked out. If you have questions regarding equipment usage at the Rec Center, please contact Equipment Etc. at 979-845-4917. Visit the Outdoor Adventures Rental Center or call 979-845-7035 for details and a price list. Structured programs such as the indoor climbing facility and group exercise classes require an additional charge. Please call Member Services at 979-845-7826 for specific information on guest passes and eligibility. *All guests must be 18 or older to purchase a 3-day, week or month guest pass, NO EXCEPTIONS. All persons under the age of 18 MUST be within arm’s reach of an adult at all times, NO EXCEPTIONS. All guests must be 14 or older to enter the Weight and Fitness Area. Lockers in the Student Recreation Center include full, half, and box sizes and may be rented for the entire year or by the semester. Any open lockers are made available for rental beginning the Thursday prior to the first class day of each semester. The Rec Center Member Services Desk accepts cash, local checks, Visa, MasterCard, American Express and Discover for payment. The last date to renew lockers will be clearly posted in each of the locker rooms. Rec lockers that have not been renewed by the requested date will be cleared and rented to a new user. A $10.00 fee will be assessed to retrieve cleared items. Faculty/staff, spouses, and eligible dependents must purchase a Rec Membership in order to rent lockers in the Student Recreation Center. Full and half locker rentals include complementary towel service. For other customers, towel service can be purchased for the rates listed below. Free lockers are located throughout the building for our patrons’ use. Rec Sports operates a towel service at the Equipment Etc. desk that is available for Rec members and guests. Towel service is NOT included with membership; however, it is included with certain locker rentals and guest passes or may be purchased separately. FREE with rental of a half or full-size locker. FREE with purchase of a day, week, or month guest pass. All purchasers of towel service (except for day use) will be issued a towel card. This card must be turned in at the Equipment Etc. desk in order to obtain a towel; patrons not having their towel card will be required to purchase daily service if they wish to obtain a towel. Purchase of towel service entitles the patron to use ONE towel at a time; however, the patron may exchange a dirty towel for a clean towel. Both bath towels and sweat towels are available for use. The patron’s towel card will be returned when their towel is returned. Rec Sports is not responsible for lost or stolen articles. Members and guests are encouraged to store all personal belongings securely in lockers provided throughout the Rec Center. Rec Sports staff members are not permitted to hold equipment, valuables or bags for members. Found items should be turned in to the Member Services Desk. 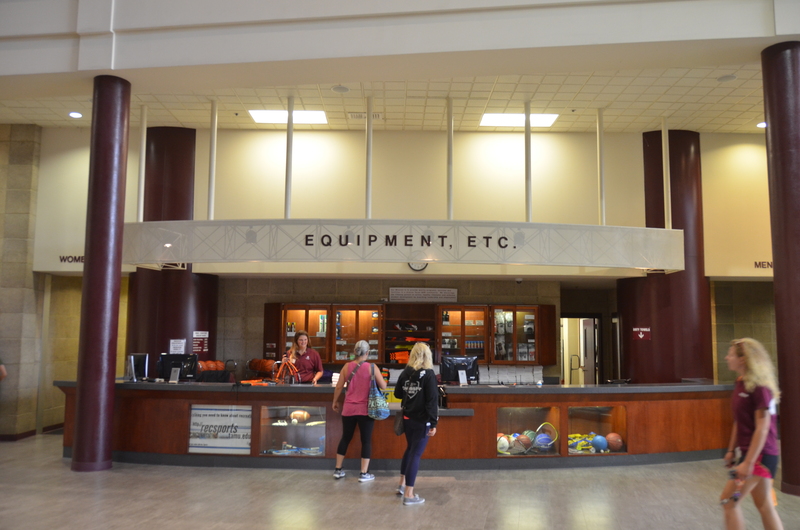 Equipment found in all Rec Sports facilities will be sent to Member Services at the Rec Center. Inquiries regarding items lost that day should be made at the specific location. On the following day, inquiries should be made at the Rec Center Member Services Desk or call 979-845-7826. Equipment not claimed at Member Services will be forwarded to MSC Lost and Found. Looking to promote your club or academic department on campus? Look no further! The Rec Center offers groups the chance to set up a resource table in our lobby to help bring awareness to your organization. Your organization is officially recognized by Texas A&M University. The organization has not exceeded the time limit of one table representing three (3) continuous days in each calendar month. The application form has been completed in its entirety, including the appropriate signatures. If a student organization will be doing sales, or any sort of cash exchange, an approved concessions permit must be obtained and presented with your resource table request form before your request can be processed. To get a concessions permit, visit the Student Activities office at Koldus. The Resource Table Request Form can be downloaded here or obtained at the second floor Reception Desk of the Student Recreation Center. The form must be completed and turned in to Kelly VonDrehle via email at kvondrehle@rec.tamu.edu, or at the second floor reception desk of the Student Recreation Center, or mailed by campus mail to Kelly VonDrehle, Department of Recreational Sports, mail stop 4250 at least one week prior to the first day requested and no longer than 28 days prior to the first day requested. The Department of Recreational Sports will only reserve two tables at any one time. When the Resource Table Request Form is approved, you will be emailed a confirmation to the email address included on the Resource Table Request Form, if space is available during the time you requested. Organization personnel must be present while the table displays your information. We request that you do not ask Rec Center employees to watch your table or answer questions, and you remove your material during hours your personnel are not available. Storage is not provided at the Rec Center. Please remove all your material when your resource time is over. Please pay particular attention to removing any tape you may have used. Please clean the table if it was soiled during your use. A copy of the signed resource table permit must be on the table throughout the time designated for use. Resource table users may not advertise on anything but the table reserved for their use. Do not tape or hang signs on walls or columns. Your information may not be placed anywhere else within the Rec Center or in any Rec Center flyer stands without permission from the Assistant Director of Communications. A representative of the group/organization must be present at the table during the hours requested. Rec Center personnel are not responsible for the table and materials during the reserved time. Materials may not be left unattended. Resource table users must remove all signs and materials after each day that they run their resource table. Remove all tape and debris, wiping down the table if necessary. Materials left on the table at the end of the day will be disposed of by Rec Sports staff. Rec Sports will not store materials for resource table users at any time before or after their designated table reservation. Organizations may reserve a maximum of two consecutive dates in one calendar month. All requests must be submitted at least two weeks prior to the first day and no longer than 28 days prior to the first day. Resource table users may not interfere with Rec Center users as they enter or exit the building by handing out information or products. Users must freely approach the table. Resource table users may not hand out the products/materials of event sponsors, companies or other organizations. Materials on display are restricted to event information and may not advertise sponsors without prior approval. They may not display the logos or banners of said sponsors. Promises made to sponsors by groups/organizations are not the responsibility of the Department of Recreational Sports, nor is the Department bound by those promises.